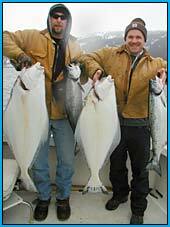 Contrary to popular belief, Kachemak Bay and Cook Inlet are full of Salmon & Halibut all year round. 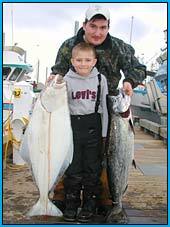 Daniel fishes all year with the exception of a week vacation here or there so Winter is a great time to come fishing. 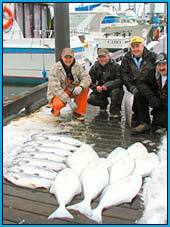 The Feeder King Salmon have migrated up from Canada and the Pacific Northwest to feed before returning to their rivers to spawn. 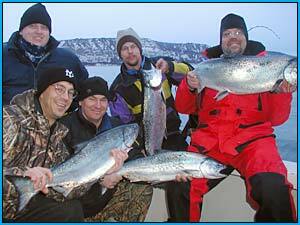 Winter (Feeder) King Salmon are the most sought after fish in the Winter. With its high fat content eating it is just as big a treat as catching it. 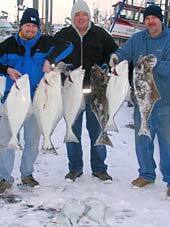 Although most halibut migrate out to the Gulf of Alaska in the Winter to spawn, they may be targeted with success or caught incidentally while fishing for King Salmon. 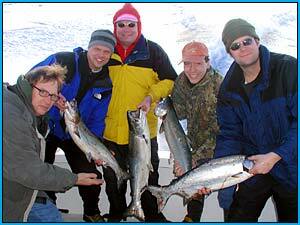 With its breathtaking scenery, peaceful surroundings, and bountiful fishing, Winter King Salmon fishing is definitely one of Alaska's greatest cabin fever relievers.